$1.99 (regularly $3.99) 6/18/2017 - 6/22/2017! It's time to discover My BEST EVER Dreams - the series of what will soon be 50 books created just for young readers. Stunning images blend with a wonderful story to help children discover Horses, Puppies, Elephants, the Ocean, the Jungle, Trucks, Things That Fly, Summer Fun, and SO much more! Your young readers are sure to want every one of them! REVIEW: I like to read children's books before I introduce them to little ears , and eyes. Each horse has a story of it's own, told by it's child. Relaxing, fun and teaches as well as entertains. Horses of all shapes and sizes and colors are met by the reader, each with their own little story....and life lesson, too. 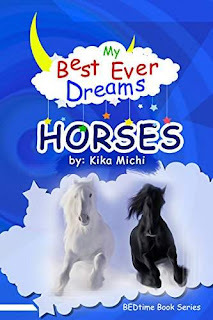 The illustrations are lovely and gently colorful....the horses personality is revealed through the child's words.. Fanciful, yet thoughtful, and just right for a child's developing imagination. Highly recommend this first BEDtime book! REVIEW: I can't wait to read this adorable story to my granddaughter! Beautiful pictures, to be sure, but it's the story that draws you in! Peaceful, positive, and fun to read, the words gently carry you through the adventure and transitions beautifully into being ready to sleep. We all know the power of positive words and images. My Best Ever Dream - Horses delivers! Highly recommend!! Discover My BEST EVER Dreams for just $.99 today!